I haven’t had to plan very many dinner parties in my life. We lived away from family so we would come home for the holidays and just sit and eat. Everything was cooked and baked and waiting. Since moving back to our home town and now that Sadie is getting older, it will soon be my turn to have everybody over for a dinner and the family just show up. 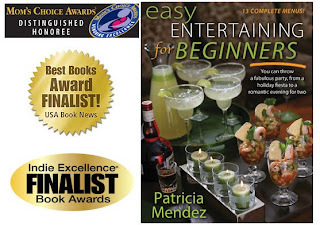 And now that I have a copy of Patricia Mendez’s book, Easy Entertaining for Beginners, they will think I have been doing this for years…..(unless they read this review first….). The book is filled with 13 complete menus with recipes and instructions, full color photographs, ideas for music, activities, drinks, practical advice and party etiquette, 13 checklists for step by step planning, preparation and presentation. And last but not least CONFIDENCE!!! No more burning the potatoes waiting for the turkey to finish cooking and no more guessing what should be put on first so that it will all be ready at the same time. I can now make a romantic dinner for 2..(okay 3..who am I kidding) or a killer dessert to impress the in laws or tea and cupcakes for my girlfriends or Sadie’s when she gets to be a bit older. This book is simple to read with all the step by step guidelines. It will make your guest feel like you went WAY overboard and maybe they will repay the favour.